Thank you for a great podcast, great show notes too! After listening to this KNITTING podcast for years, I, sadly, must let it go. They have gone Special Snowflake and used their podcast to impose their political ideology onto their listeners. Not a big loss, I guess, as the frequency of the episodes has become sporadic and inconvenient. It's really too bad. This used to be one of my faves. Nicole and Jenny have gotten me through so many good times, bad times, and boring times. I hope y'all keep doing what you are doing. This podcast was one of my first I ever subscribed to, and it never lets me down. Long time listener. I have enjoyed the banter and reviews and views. Keep it up. Nicole and Jenny are fun to listen to. Their podcast sounds professional, but their conversation sounds like two of your friends chatting about knitting and life. This is far and away my favorite knitting podcast, and I subscribe to many. Fun, positive conversation that centers on knitting. I highly recommend this podcast. This is a great podcast that is not just knitting. I find it really fun to hear from someone who is back in school as an older (read not right out of high school) student, and hearing how her teachers and other students react to her knitting in class. Also fun to hear about actual winter, living in Florida, we don’t get to/need to wear knits the same way that Nicole and Jenny need to, so that’t always a treat. A nice mix of projects for both men and women, as well as kids stuff as they knit gifts for little ones too. Consistently informative about new yarns and patterns. The young women are always challenging themselves to learn more, whether it be about fiber, fit or life. I always learn and increase my list of favorite patterns after a podcast. Nicole and Jenny are very enjoyable to listen to. I wish they could podcast more often but I will take what I can get. the warmth of their friendship is palpable, the conversation informal, informative, and fun...this and doubleknit make for happy pod listening. love you guys! I really love to hear these two friends talking about knitting and sewing, they have intelligent things to say and are honest and funny too. I love hearing their lives evolve (babies, jobs) and really like their taste in knitting patterns! All around, Love! I'm a longtime listener and I always look forward to new episodes. I really enjoy the relaxed way of conversation between Jenny and Nicole. It's fun to hear about longterm projects like the Bourne sweater or how Jenny and Nicole set up new challenges to work their way thru their stashes! This was the very first podcast I ever listened to and I have listened to every one. I am always behind on my Stash and Burn episodes because i save them for last. They are such a treat. Thanks for all your time and effort. This is one of my favorite podcasts. Jenny and Nicole are down-to-earth and fun to listen to. I'm a long-time subscriber to this podcast. Jenny and Nicole are always able to inspire. Jenny and Nicole are awesome. They are educational, entertaining, and down-to-earth. An absolute pleasure to listen to, every time. Thanks, Ladies! I have listened to every episode, and I look forward to many, many, many more. I look forward to each new episode. I find Nicole and Jenny a wonderful and funny duo. Wish they could get together more often to record, but realize they have busy lives. They are always keeping up with new knit designs and designers, and it is interesting to get their opinion on what's happening in the knitting community; and their occasional opinions on everyday life. I have listened to this show for quite a while and have never gotten around to writing a review- so I owe you, Nicole and Jenny! You guys have kept me company through many a dull spreadsheet at work, through innumerable traffic jams, as well as when I am actually knitting. I really enjoy the conversational style of this show, and I have been enjoying the newish sewing content too. Thanks for the fun show- I really enjoy it! I wish they had time to record more frequently! I just wish they recorded more often. One suggestion - repeat the name of the book, pattern, ezine, etc at the end of the segment. I sometimes miss it, and it would be great if I didn't have to rewind. They're always so entertaining and informative! Still love listening to the girls talk about their endless stash. :). Great pattern ideas and it is just fun. Of all the podcasts, this is still one of the best. My only complaint is that this podcast is causing me to increase my stash and buy more patterns! It's great for keeping up on yarns, patterns, tools, tips. Love the working together to solve another's knitting dilemma (even if I can't see what you're talking about). I've listened to all the podcasts a second time to see what I might have missed the first time through. Keep them coming, Nicole and Jenny. Your hard work to produce them is appreciated! This is a sure thing for me. I know I'm going to enjoy every show. I have picked up three or four project ideas from Nicole and Jenny. I happen to be browsing podcast when I found stash and burn. Love it! I listen to the podcast when I'm cleaning, Keeps me motivated to finish so I can reward myself with some knitting:) oh and Jenny has the best laugh in the world, hands down, totally makes my day. Listen to them back and forth from work. I never get tired of them. This is the only knitting podcast I still listen to and have from the beginning. It's fun to hear what Nicole and Jenny are working on and they always provide links on their website to the books and projects they review and discuss. I love hearing about the yarn stores in San Francisco as well. This is one I just love to listen to. It's relevant and interesting. Thanks for podcasting Nicole and Jenny! This is a great podcast to listen too when you're missing your girlfriends or wishing your girlfriends knit! i love the fact that there are more than one podcaster so the ideas flow nicely. Its my favorite girl-time with knitting thrown in! Jenny and Nicole will become your friends and you will wish you were there with them in person for every podcast. Very fun yet full of great knitting (and sometimes sewing) information. I like this podcast but my biggest complaint is their reviews of patterns/magazines. When they are discussing them, they have the magazine(s) in front of them and they talk as though we can see the magazine. Otherwise, I enjoy hearing them talk to each other and have real conversations. I don't feel that there is too much inside jokes or things that we, the listeners, are not in on. Nicole and Jenny have kept me coming back for more episode after episode. It's like knitting with friends each time. I've gone back and listened from episode one to the current one. The only way it could be better would be if they could record weekly, but I guess they are entitled to lives of their own, LOL. I look forward to every new episode. This is one of my favorite podcasts. Nicole and Jenny are so much fun and I love listening to them talk about their stash and what they are knitting next. I find myself agreeing often with them when they talk about why they stash or projects that are taking forever. It's a great podcast. I really like this podcast, however, I can't stand the fake laugh on one of the women! She doesn't always do it, just occasionally. It Drives me crazy!! I really like this podcast! I love Nicole and Jenny! They're funny and easy to relate to - I've been listening for years and I always look forward to new episodes. Great podcasting team. They are very knowledgable and laugh a lot. Fun to listen to. In my top ten. I love Stash and Burn! I like the format--two friends sitting and chatting about knitting and the latest yarns and patterns. I actually started knitting due to listening to these Nicole and Jenny. They make patterns seem so intrigiuing. I wanted to knit what they chose. They led me to Ravelry, to Knitty, to Interweave Knits. I appreciate their introducing me to the world of knitting. We also hear just enough of their personal lives to feel like we know them and can relate to their world. Finally a podcast about knitting! This podcast has it all. It's enjoyable and entertaining to listen to and it's also informative when it comes to knitting. Nicole and Jenny are not only fun but also seem very down to earth. I'm so tired of other podcasts where the hosts ramble on for an hour or more about nothing useful. Nicole and Jenny are a joy to listen to! Entertaining conversation between two knitters. None of my good friends knit, so the conversations on this podcast are the kinds of conversations I would like to have with my friends. I like that they talk about new patterns too, I hear about designs I might have missed otherwise. I've been listening for the past couple months and intend to continue. I've been listening to Stash and Burn for several months now, and am finally moved to add my kudos to the other reviews. These ladies are easy to listen to, and they actually talk about knitting - current projects, future projects, successful projects, not so successful projects. They talk about yarn - what they like or don't like and why. Please - give them a listen! Does anyone know where to get the "older" Podcast episodes?? I love this podcast. I have listened to every episode so far, and I think it is the best knitting podcast out there. I find that I usually have to take a "break" from most podcasts, but I never get sick of this one. Nicole and Jenny are funny, and informed! I'm not sure if I could say anything that hasn't already been said - this is a fantastic podcast that YOU should be listening too! I can go back and listen to any of the episodes at any time and still be entertained and even learn something. Jenny and Nicole are the kind of friends I want! They are so good together and I love listening to them talk about their knitting, their field trips, their sewing, and I really like when they explain common questions by knitters. It's very inspirational and encouraging. I just love this podcast and the episodes will live on my iPod forever! Thank you, Jenny and Nicole, for the great podcast and keep up the great work! I have recently been going through my podcast subscriptions and culling those that I don't really look forward to. 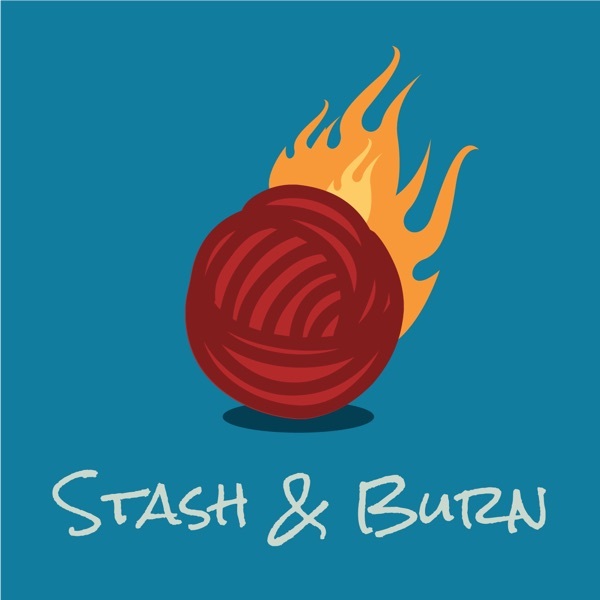 There are a quite a few really good new podcasts out there, but Stash and Burn remains one of my favorites. For me, the fact that they are local is only part of their appeal. They are informed, funny adventurous, non condescending knitters with good organizational skills in podcasting. Even though they appreciate really good fiber, they don't come off as snobs. They are not even afraid of knocking the queen of knitting books, Interweave Knits, off her pedestal. Keep it up, Jenny and Nicole.